Today I was invited to observe a black "sash" test given at a local kung fu school. It was the fighting part of the test; I missed the forms and self defense portions, though if they were anything like what I witnessed this afternoon I didn't miss much. This event was, quite frankly, painful to watch. The testee was a young man in his twenties who tells me he has about five years of training in this style. He was in shape and had a decent arsenal of techniques, but after his tenth match or so he started running out of gas and subsequently took some pretty bad hits. I have mixed feelings about these rank "tests", usually for first dan or its equivalent, that amount to little more than glorified hazing. This place also had an aura of posturing and bad intentions that was palpable. I suppose the people that promote this sort of thing feels it gives their club credibility or a tough rep. Martial arts training should push one outside their comfort zone in order to improve realistic skills and mature as a practitioner. C.G. Jung said that any kind of real development obeys only "brute necessity." In other words if you're cruising through your training or not playing realistically enough you're probably not making any great strides. Then there's the fanatical approach. 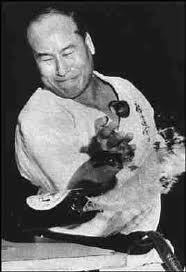 In Kyokushin karate, the "100 Man Kumite" is considered the ultimate test of endurance in sparring. The concept of squaring off against a hundred consecutive opponents was devised by the style's founder, Mas Oyama. Oyama's training regimen also included punching trees to a pulp, using shuto to chop the tops off beer bottles and meditating in the wilderness for months on end. Some instructors get hung up on fostering "indomitable spirit" and I think this is what leads to these marathon sparring sessions and other bizarre methods of training, like standing in shiko dachi (horse stance) while throwing air punches for half an hour. Shugyo (intense training) was originally devised to be undertaken as a solo practice for introspection and transcendence, not group agony. Preventive measures, awareness of your surroundings, and the ability to respond rather than react (mu-shin or no-mind) have far more utility than being able to complete a martial arts version of an Ironman competition. I'm all in favor of trainees developing a high level of fitness, reading skills, and even intuition, but these concepts should fall outside the purview of a martial arts club. Best to tackle these things on your own watch. * From Japanese bujutsu, lit. "mind and eyes both see." † Glenn J. Morris, Ph.D. 1993. Path Notes of an American Ninja Master. North Atlantic Books.